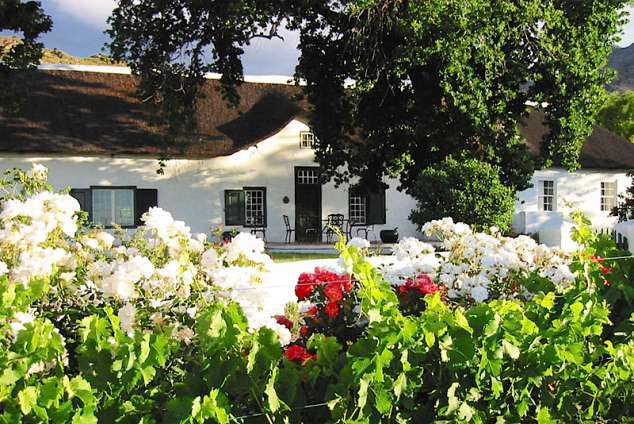 Eensgevonden Vineyard Cottages - Rawsonville Accommodation. Eensgevonden is a beautifully positioned farm, with 360 deg views across the Breede River Valley and the magnificent mountains surrounding it. It is an hour from Cape Town, in the middle of one of the largest wine producing areas and is part of Route 62. Friendly hosts will give you a warm welcome and happily guide you through their vineyards, to swim in the rock pool or hike in the mountains. Or to visit their farmstead - a National Monument - the oldest farmhouse in the valley dating back to the 1720's. There is a choice of three "Cape" guest cottages which in total sleep 10. Two 2-bedroomed (queen & 2 singles) and one 1-bedroomed cottage (one queen) - each with separate bathrooms with showers/bath. Each cottage is set in a large indigenous garden with private braai/BBQ areas. The cottages are bright and airy, with big double doors opening onto large stoeps/verandas. A great spot for evening sundowners. They are fully equipped for self catering - fridge, stove, microwave etc. "Breakfast in a basket"is available on request. The beds are extremely comfortable with crisp, white linen and feather duvets! The cottages have no TV's or radios! Wireless internet access is available for those who can't travel without their laptop! The farm Eensgevonden includes a 400ht mountain nature reserve. Just on your doorstep, there are hiking trails through the mountain fynbos, with fantastic views all round. A 5min walk from the cottages is a lovely secluded mountain pool for swimming in the Summer and in Winter, the cottages are cosy with fireplaces, whilst the surrounding mountains are snow-capped. There are about 20 cellars in a 15kms radius of Eensgevonden, all giving you the opportunity to sample the excellent wines and food of the area. For a quiet getaway from the city - some wine-tasting, bird-watching or hiking - this is the place to visit! 29569 page views since 07 Mar, 2007.